I wanted this trend edition because of the theme, after all Snow White is one of the rare fairy tales where main character is not blond. But in the end I was pleasantly surprised by quite a few of the shades. Let’s start with my favorites. 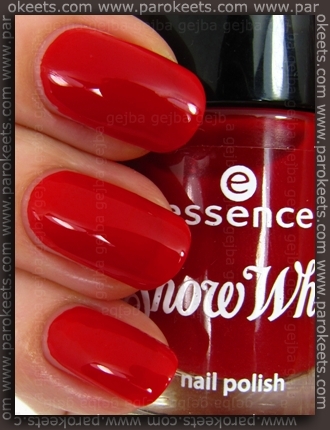 Essence Snow White is one of those reds that you immediately identify as something special. This is first red nail polish after Illamasqua Throb that I can say it was crush at first sight. It’s more to the cool side, but for some reason becomes slightly warmer in strong light. Formula was great, possibly one-coater if you don’t mind visible nail line … which is slightly seen even after second coat. My second love is Essence Grumpy. What can I tell you except it’s perfect electric blue shade with good formula. As this belongs into category of slightly thicker and highly pigmented nail polishes, you can use only one coat for full coverage … if you’re careful that is. 2 coats + top coat. 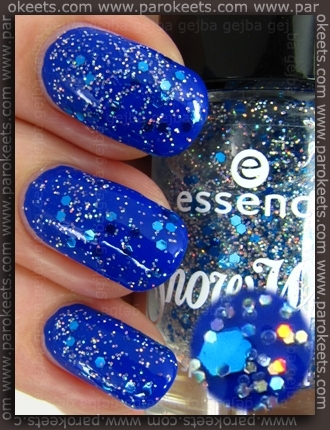 Pair Grumpy with Essence Prince Charming and you get drop dead gorgeous combo of electric blue base with 2 coats of blue and holographic glitter. Essence Sleepy doesn’t look really sleepy to me, more like great spring/summer base. Color is on of those tricky shades that look more greenish one moment as bluish the next. Essence added as fine as dust shimmer, but it doesn’t really translate onto the nails. 2 coats. Essence Dopey is another almost pastel like shade and this one is also “moody” – it can be more purple or blue. Formula was sheer, so I used 2 thicker layers + top coat. 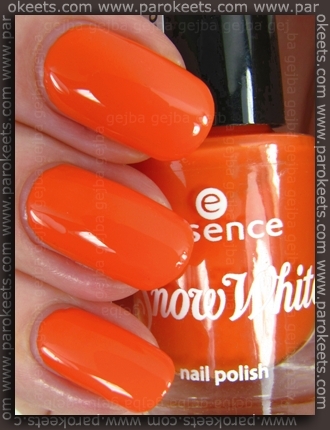 Essence Bashful is another Snow White TE polishes with identity crisis. :D Only this time it’s how green is the base. Sometimes it looks like somebody put grayed out layer over it and sometimes it look a lot more rich green. Shimmer is lovely – I just with those tiny tiny flakes were larger. I found all toppers to be slightly problematic … with Prince Charming being the best one. I think it’s the clear base they used to suspend glitter in + lots of huge chunks of glitter. I had hard time placing the glitter onto the nails as majority got stuck on the brush. I had to pat the glitter on and then arrange it by toothpick. 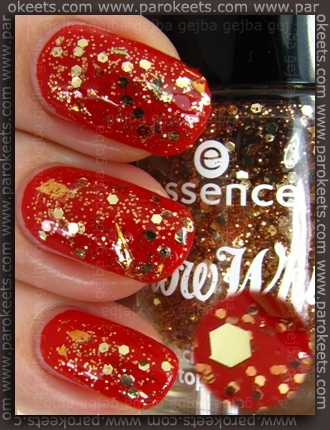 Essence The Huntsman topper is not special to me because of it’s gold hexagons. What cough my eye were strange glitter particles that looked like plastic duochromes(?). I wish Essence would shred those paricles in smaller pieces and mad topper just with those beauties. 2 coats over Snow White. Essence Evil Queen was my least favorite topper. I simply did not like anything about it – glitter was too big, application not easy … 2 coats over Dopey. Essence Doc is nice orange shade. Not too orange and not too overpowering. I quite liked it. Thick and pigmented formula allows for one coat for full coverage. 2 coats + top coat. Essence Sneezy and Happy did not make it to my honor roll – I didn’t like either one. Happy leans to much to ocher side and Sneezy is not my kind of brown. 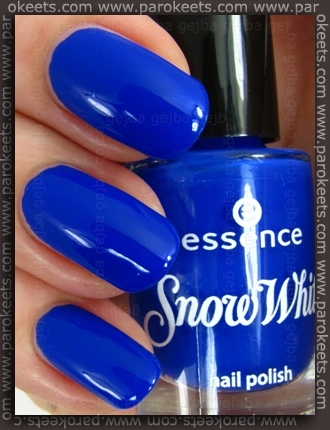 Which one is your favorite from Essence Snow White trend edition … and does anybody actually like last two nail polishes? I just got sleepy today and it bubbles like crazy, I can’t get it to go on smoothly, did this happen for you? Mogoče v kakšni Tuševi drogeriji? Punce mi pravijo, da je precej izropano. Nice video! Great choice of polishes for the give away. I also liked Snow White and Sleepy. Too bad that the glitter in Evil Queen is to big. My favorites are Sleepy and Grumpy. Praktično vsi palčki so mi všeč, ampak itak vsi vemo, katera najlepša v deželi je tej :crown: . uuu, čisto vsaka barva je čudovita! I love Grumpy and Dopey, right now blues r my thing! I love this collection!!!! And I love all Essence products generally!! I LOVE Sneezy!!! It’s my type of taupe brown and I think the glitter looks great! I’m not so keen on Happy though, because I have a couple of those ochre/mustard yellows already (to be ‘edgy’, not!!) and do not want any more! I love them all, and yes I do like Sneezy and Doc! I really like this collection, if only it would come in the netherlands.. I found the full display as well and went a bit crazy :wink: . I passed on the glitter toppers because I had a sneaky suspition they won’t behave on the nails. They look amazing in the bottle though. I actually do like Happy, it’s my current mani, lol. All in all I think these have an amazing formula (all of the ones I got are one coaters) and I just love them. Thanks for the giveaway, all the colors look great! Grumpy is a great blu, good choise! Grumpy is a great blu! Good choise! I really love your swatches! I have a few friends trying to find these! ^_^ they are beautiful! Snow White pa Grumpy! Bo treba hitvo v dm! :) Upam da je še kaj ostalo! plavi mi je najljepši i jedva čekam ga kupiti ako ga ulovim!! Vsekakor, zelo mi je všeč ta LE, bravo Essence. Grumpy and Snow White are my favourites too!!! Absolutely gorgeous! Po tem, ko sem pogledala te tvoje slikice, pa bom danes skočila še po Sleepy, Dopey in Bashful… Če je sploh še kaj ostalo. No, zdaj me pa prav firbec matra in ga bom sprobala danes zvečer. Poročam… Upam, da ne bom razočarana. I love this collection! Usually I’m not that crazy about the Essence TE’s but this one is great. Wish I could get these here. I have a friend who can get Essence for me but I’m not sure if she’ll find them. Would love to win the blue ones as they are definitely my favorites. Great giveaway!